A.O.G. Age of Gold, a Saunders first generation hybrid. A.H. Alice Harding, a Lemoine first generation hybrid. A.I.W. Alice In Wonderland, a Reath seedling A225 from Alice Harding by Golden Era. A.M. Anna Marie, a Seidl seedling #13 from a Reath seedling A197 by a Daphnis seedling. Au.H. Autumn Harvest, a Seidl seedling #42 from Golden Era by Alice Harding. A197, A198 and A199 Reath seedlings from a saunders seedling (F1) by a Daphnis seedling. B.F. Black Forest, a Seidl seedling #33 from Golden Era by Chinese Dragon. C.D. Chinese Dragon, a Saunders first generation hybrid. E.E. Exotic Era, a Reath seedling A201 from Machioness by a Daphnics seedling..
F.R. Fuchsia Ruffles, a Seidl seedling #173 from Anna Marie by Shintenchi (Moutan). F2A and F2B Two Saunders second generation hybrids. G.E. Golden Era, a Reath seedling A199 from Golden Isles by a Daphnis seedling. M.M. Mystic Mood, a Seidl seedling #97 from seed parent #11: (a Daphnis seedling D223 by Chinese Dragon) and pollen parent Golden Era. R.E.F. Rosalind Elsie Franklin, a Seidl seedling #158 from seed parent #35: (Golden Era by Chinese Dragon) and Zephyrus as the pollen parent. Z Zephyrus, a Daphnis seedling D204 from Suisho Haku (Moutan) by F2A. 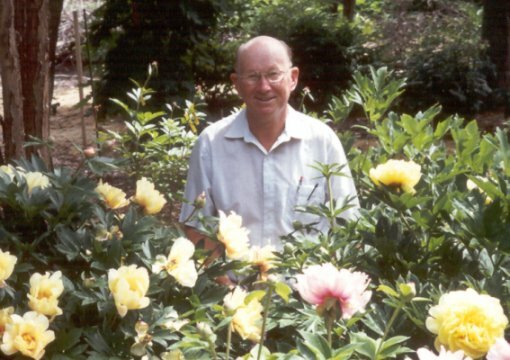 William Seidl, recipient of the Saunders Memorial Medal in 2003. "For creating futuristic woody peony varieties by combining winning gene pools of the best garden varieties. For expanding peony horizons by intelligent, thoughtful writing and positive conversational promotion. For teaching, mentoring and sharing. Congratulations." ---Roy Klehm, 1989 recipient of the Saunders Memorial Medal. "May your beautiful hybrid peonies forever bloom in gardens worldwide." --- Steve Johnson, president (2002 - 2004), The American Peony Society. Last Updated: 19 January 2007.